I have two bits of news for you. First - I hit a respectable 40 years today! I am officially old enough to forget about diets and pronounce my ample padding a normal order of things and just get on with it. Secondly - Whimsy Stamps & Make it Crafty have come together to create a fun Urban Themed digi collection! funky wall sayings, city landscapes and of course a range of super cool street signs. 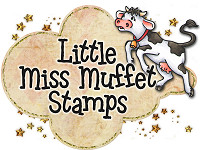 Then of course, what better characters to incorporate into such a scene than the fabulous KennyK rubber stamps available from Whimsy Stamps! Our incredibly talented Design Teams have had a blast playing with all the different elements to bring you LOTS of inspiration! HOP A Starts Here & HOP B Starts HERE at my blog! You are currently on HOP B and should have arrived to the very beginning, you lucky duck - just keep hopping along to enjoy wonderful masterpieces of amazingly talented crafters. I combined Hot Weave Kenny K stamp with different urban background elements from Make It Crafty. I also used a sentiment from City Talk digital sentiment set by Raindrop Echo Designs. Then I printed barbed wire from the same set in full scale on pearlescent paper and heat embossed in silver. Afterwards I went at it with different ink pads and silver leafing pen. The image is mainly coloured with Copics - there are some little shading areas addes with Caran D'Ache Swisscolour pencils. Once I had decided on silver colour theme I just started piling on all the silvery stuff I got my hands on, lol. Those corners are actually silver foily stickers, I splodged them with BG72/75/79 and added some silver brads. Noth half bad! Your next stop on HOP B is CAROLE, but before you go make sure you leave a comment below! Be there... or be square! Happy Birthday, Annika, enjoy every moment! Your card is out of this world, the background looks stunning!!!!!!!!!!!!!! Happy 40th Birthday Annika, hope your having an awesome day. Happy Birthday and only 40! Wish I could say the same. I LOVE your silver accents! What a fabulous card! wat een geweldige kaart heb je gemaakt en erg stoer met dat zilverkleur in je kaart,helemaal geweldig mooi! OMG Annika, this is awesome. I LOVE what you did with this card it is amazing! I have been looking for urban digi backgrounds and these are excellent! Hi Annika, and a very happy birthday to you. Wait until you get to 50, then you can talk! LOL. Another stunning card (fab image of course! ), and great colouring. Enjoy your day. I've been looking at these cards for a couple weeks now and am just in awe of your talent. I've all the elements of this. Your coloring is superb and I love the barbed wire! I love the barbed wire background - where did you get it? Your card rocks. oh i love that background how fun!!! thank you for sharing. Amazing coloring as per your usual style of fabulous Annika, totally radical! Happy Birthday!Welcome to the 40 club i joined in april!LOL! Awesome card. Fantastic coloring. Love these new images. Happy Birthday. Fabulous card with fabulous colouring. Love all the metal embellishments. Happy 40th - enjoy the day. Wow this is fabulous and your colouring is awesome. I love your card it's fantastic.. Looks like real silver. Wonderful card and HAPPY BIRTHDAY! Happy 40th Annika! I love all the details..amazing! Wow what an amazing card, love all the detail you've added awesome. Happy 40th birthday welcome to the 40 club. Wow, this is so cool. The details are super. I love it. This is the beginning of a super bloghop I think. Woo Hoo! Happy 40th! I love ur take on turning 40. hehehe Hope ur having a gr8 day! She just pops on that background. Love the colors you've chosen. Happy Birthday Annika! I love everything about your card :) Amazing coloring as always! Awesome as always Annika! I really like the skin tones you used with her...looks like you put a bit of green into that combo and it really makes it look life like. This is completely amazing, Annika - such complex colouring - metallics are not the easiest, but you are soooo good at them. Happy Birthday to you - a friend's daughter is your birthday twin (but she's 21 today!!!). Best wishes as you go back to work tomorrow - keep crafting and blogging though! Oh my gosh...what a stunning masterpiece you created! Simply GORGEOUS!!! Happy, happy birthday, dear Annika! Wow. Your card is awesome ! Awesome card - perfect colouring and great silver accents! HAPPY BIRTHDAY! I forgot to tell you on my last post so had to put in another. Hello Annika, I am still in the girly, lacy, pink period, soooo I do take a deep breath when I look "street art". What I have righ now under my eyes, is quite an exception! You are able to make beauty out of a garbage can! and this young lady's smile is just extraordinary! Just beautiful an awesome work. I love it... OK. I'm old... but you have given necessary inspiration to try my hand at such kind of images!!! LOL. And now your card - WOW - your colouring is ALWAYS incredible - I have been in awe of your work for soooo long and silently stalking - but now I'll happily shout out how amazing you are!!! Wow, this is so cool! The coloring is amazing! It almost looks like a painting! I'm so so impressed! The embellishments are fabulous and I love love love the bottle cap die and stamps! Happy 40th Birthday!! Been there, done that, got a t-shirt to prove it!! That's one seriously fierce piece of artwork! Love it! love the card...just the right amount of silver to keep us guessing. love it. First of all, Happy, Happy Birthday! Now the card... absolutely breathtaking Annika! Your colouring skills and creativity is the best! Wow, seriously gorgeous. Beautiful coloring. Very pretty card. Love coloring and embelishments! Gosh this is fabulous. Love all the silver especially like that cool back ground. Happy Birthday Annika! Welcome to the 40's, life just gets better once you reach 40 (apart from all the extra aches and pains. Lol.) I love your card, as always! The barbed wire background looks fantastic. 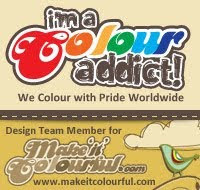 The colours you have used are amazing. Thanks for sharing your art work with us once again. Happy Bday! Love your card!!! This is just AWESOME! This is just the coolest card I have seen EVER! Thanks for joining us at Do You Stack Up and good luck. Fabulous! really nice card.great job ! Happy Birthday! Cool card! Love the barbed wire in the background, and all the little details. Annika, your card is amazing!! I love your coloring and the background is awesome!! Wonderful job!! woww this card totally rrrrocks !! really amazing work here :) love this ! Wow, incredible card! It is just fantastic. Thank you for joining our EMBOSS IT challenge at DYSU. It’s a pleasure to see your work! Your card is stunning. Your coloring is out of this world. I love all the elements you used on your card. Card is so wonderful. Super cool card! Love all the details. Your coloring skills are amazing; love all of those folds in her clothes....Super! This is such a great card. Very cool ^^ I just love all the metallic elements. Awesome card - fab image and great embellishments. Absolutely Awesome Annika and a Happy 40th Birthday to you. Don't worry Girl, life begins at 40!! This is beautiful Annika. You have created an amazing scene and your coloring is brilliant as always! Love the bits of flower hardware you used. Really gorgeous! ps. Just got back from vacation out of state but wanted to wish you a Happy belated Birthday! Oh the card looks really great. Thanks for joining us at CUYL. Wow Annika.. Amazing creation with perfect colouring.. love it! I had managed to sail through 36 years of my life without any inclinations towards crafting and in firm knowledge that cutting a straight line is physically impossible and therefore pure myth. Then I got preganant second time, had a sudden idea to make some cards and bought a guillotine. The rest is history. Look at Barbara's wonderful images! Lovely Laura who gave my blog a make-over!